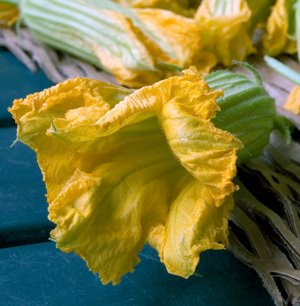 The best way to enjoy zucchini blossoms is enrobed in a simple batter made of cold sparkling water and flour, deep-fried in hot extra-virgin olive oil until the batter is crisp and golden and the blossoms are coaxed to their full potential of sweetness. I've tried other batters (beer, Prosecco, egg and wine) and none compare to this straight-forward version. It's a classic case of less is more. 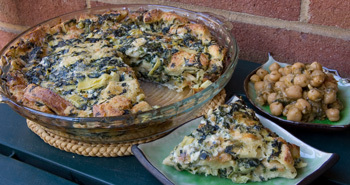 The same can be said for the blossoms themselves: most recipes call for stuffing them with all manner of cheese, ground Mortadella, herb fillings, and other embellishments... adding a stuffing only takes away from the blossoms' delicate flavor and ethereally light texture. As for the oil to use when deep-frying, I find extra-virgin olive oil to be the best: its flavor is bright and clean, it yields lighter fried foods than peanut or other oils, and it doesn't smell up the house the way other oils do. As long as you don't overheat it, it is extremely stable for deep-frying and produces exceptional results. And one final word of advice: Use the blossoms the day you buy (or pick) them, as they are extremely delicate and wilt quickly. When you are ready to fry, combine the flour and sparkling water in a large bowl until a thin batter results. Do not overbeat; a few lumps are fine. Heat the olive oil in a deep pan until it registers 350 degrees on a frying thermometer. Dredge a few blossoms in the batter and deep-fry until golden and crisp on both sides, turning once. Be sure not to fry too many blossoms at once or the temperature of the oil will drop. Using a slotted spoon, remove the blossoms from the hot oil to a platter lined with paper towels. A colorful salad that tames the bitterness of endive with the sweetness of roasted peppers. Preheat the broiler. 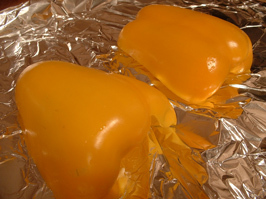 Line a baking sheet with aluminum foil and place the peppers, cut side down, on the foil. Broil for 15 minutes, or until black all over; wrap the roasted peppers in the foil and set aside to steam for 20 minutes, then unwrap, peel off the skin, and cut into strips. Set aside. Bring 2 quarts of water to a boil. Drop in the cauliflower florets and cook 3 minutes. Drain and rinse under cool water to stop the cooking, then drain again. To crush the pink peppercorns, use a mortar and pestle, or wrap them in a towel and crush them with the bottom of a heavy pan. And yes, pink peppercorns aren't peppercorns at all... But the name fits, so what's the harm? Serve the leeks as a starter, before a hearty soup, or as an antipasto. Rinse the leeks thoroughly under cool water, fanning out the leaves and running your fingers between them to dislodge any grit. Bring 2 quarts of water to a boil. Add the leeks and 1 tablespoon of the salt and cook the leeks for 5 minutes, or until almost tender when pierced with a knife. Drain, rinse under cool water to stop the cooking, and blot dry very gently. Heat a grill until it is smoking hot. 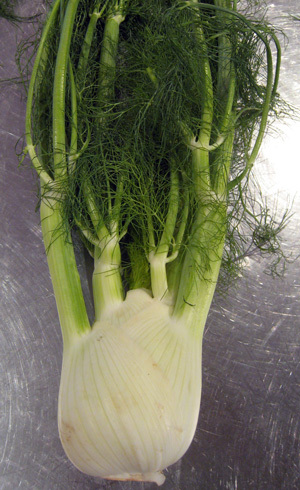 Gently toss the blanched leeks with 1 tablespoon of the olive oil and ¼ teaspoon of the salt. Grill until lightly browned and tender, about 3 minutes per side, turning once. Remove to a platter. In a medium bowl, combine the mustard, vinegar, and the remaining ¼ teaspoon of salt. Beating with a wire whisk all the while, pour in the remaining 5 tablespoons of olive oil in a thin steady stream, until well blended and emulsified. Whisk in the tarragon, chives, shallots, garlic, black peppercorns, and pink peppercorns. Okra may not be an Italian vegetable, but I grew up eating it thanks to my Turkish Nonna Eva. She stewed it with tomatoes, a hint of lemon, and plenty of onions (much like her slow-cooked beans), which I love, but my husband is not a fan of the slimy, gluey texture. So at home, I slow-roast okra instead and the result is crispy, intensely flavored okra without any hint of slime: more addictive than potato chips, and far tastier and healthier. You can add a bit of cayenne pepper and garam masala when seasoning the okra for a spicy, aromatic flavor. Preheat the oven to 300°F (preferably set on convection bake). Trim the tough stem end from each okra. Slice each okra in half lengthwise. In a large bowl, toss the okra with the olive oil, salt, and pepper. Line a baking sheet with parchment paper. Arrange the okra, cut side down, on the parchment paper-lined baking sheet; it should be in a single layer; if needed, use 2 baking sheets. 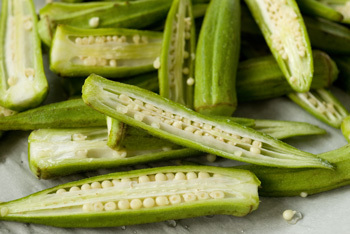 In order to crisp properly, the okra needs to be in a single layer, with the cut side facing down. 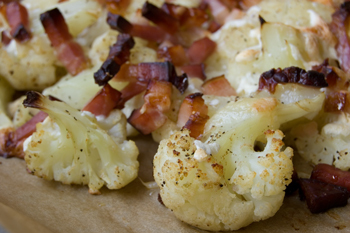 For crispier Pancetta, be sure to scatter the Pancetta on top of the cauliflower and cheese. Preheat the oven to 425°F (preferably set on convection bake). Lightly oil a wide baking dish. Bring 2 quarts of water to a boil and add 1 tablespoon of the salt and the cauliflower florets. Boil the cauliflower until al dente, about 5 minutes. Drain and shock in ice water to stop the cooking. Drain again. Blot the cauliflower dry and arrange in the baking dish in a single layer. Toss with the olive oil, the remaining ¼ teaspoon of salt, the pepper, and the nutmeg, and top with the Fontina. Scatter the Pancetta in the baking dish on top of the cauliflower. 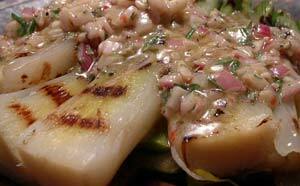 A very refreshing side dish, especially paired with fish or seafood. It keeps well in the refrigerator up to 2 days, but you may need to readjust the seasoning before serving. Bring 4 quarts of water to a boil. Add the escarole and 1 tablespoon of the salt; boil 3 minutes, then drain. Rinse under cool water to stop the cooking, drain again, and squeeze dry. In the spring, cooks in central Italy pair fava beans or peas with Pancetta or Prosciutto, creating a simple vegetable stew that tastes as delicious on its own as it does over pasta with a dusting of Pecorino. Heat the olive oil a heavy 2-quart pot over a medium flame. 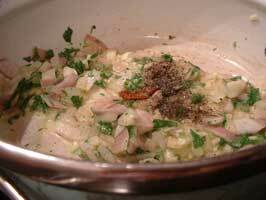 Add the onion, bacon, and marjoram; cook 5 minutes, or until the onion is soft but not golden. 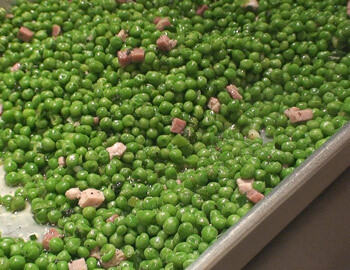 Add the peas, salt, and pepper and cook, covered, 10 minutes; add a little water if needed to prevent the peas from scorching. Look for small, bright green Brussels sprouts: they are sweeter and tastier than larger or yellowish ones. Preheat the oven to 425 degrees (preferably set on convection roast). 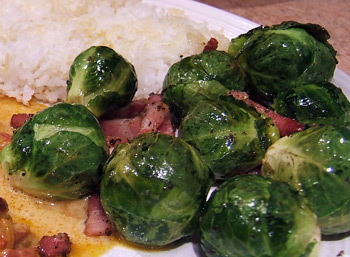 Toss the Brussels sprouts with the olive oil, bacon, garlic, salt, pepper, and nutmeg. 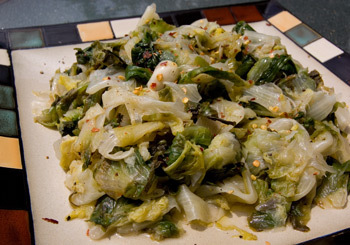 Arrange the Brussels sprouts cut side down in a roasting pan. They should be in a single layer. You can serve this soup with cheese-topped crostini (Mozzarella and Pecorino are ideal cheeses) if you want a little more richness. Place the sausages in a skillet and pierce with a fork to prevent bursting. Cook over medium heat until done, about 20 minutes, turning as needed to cook evenly and pouring in ½ cup of water halfway through cooking (steam makes the sausages more tender). Cool, then cut in quarters lengthwise and chop into ¼-inch pieces. Heat the olive oil in a 2-quart pot and add the garlic and onion. Cook 5 minutes over medium heat, stirring often, or until the onion is soft. Add the broth and bring to a boil, then stir in the salt and barley. Lower the heat to medium-low. Simmer 30 minutes, covered, or until the barley is al dente. Stir in the sausage and escarole. 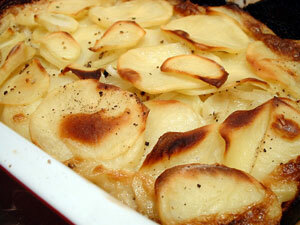 Serve in generous wedges as a side dish to meat and poultry. Make the bread pudding: Preheat the oven to 425° (preferably set on convection bake). Generously butter a 3-quart soufflé dish (or, if you prefer a crustier soufflé with more crisp edges, use a 2-inch-deep x 10-inch-round roasting pan). Beat the milk and cream together in a shallow container. Add the bread to the milk and cream and set aside to soak for 15 minutes. Meanwhile, whisk the eggs with the herbs, spinach, paprika, nutmeg, pepper, and salt in a medium bowl. Squeeze the bread gently to extract the milk. Whisk the milk into the egg-herb mixture. Stir in the soaked bread, the artichokes, the Parmigiano, Mozzarella, and Gruyère. Be sure to use freshly grated nutmeg, never the pre-ground kind, for best flavor. Preheat the oven to 450° (preferably set on convection bake). Generously grease an 8-inch roasting pan. Dust with the bread crumbs. 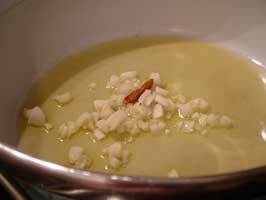 Combine the heavy cream, milk, butter, ¼ teaspoon of the salt, a pinch of the pepper, and the nutmeg in a 1-quart pot and bring to just below the boiling point. Remove from the heat. Toss the sliced potatoes, onion, garlic, and flour with the remaining ¼ teaspoon of salt and the remaining 1/8 teaspoon of pepper in a bowl. 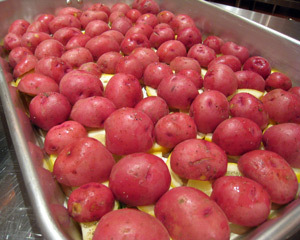 Layer the potatoes and onions in the greased roasting pan. Compact the potatoes and onions firmly with your hands; pour the warmed cream mixture over the potatoes and onions; it should come three-quarters of the way up the potatoes. Bake in the preheated oven 45 minutes, or until tender all the way through when pierced with a knife and lightly browned on top. Most people simply throw out the green leaves and stems of beets, using only the root vegetable... What a waste! My Nonna Eva taught me to cook both the leaves and the stems in boiling water just until soft; all they need after a light squeeze to drain off excess water is a dressing of olive oil, lemon juice, salt, pepper, garlic, and if you like, chili flakes. You can saute the greens and leaves with garlic and chili in olive oil after blanching if you prefer a warm side dish. Bring 4 quarts of water to a boil. 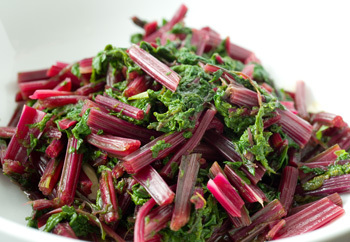 Add the beet leaves and stems and 1 tablespoon of the salt; boil 5 minutes, or until soft, then drain. Rinse under cool water to stop the cooking, drain again, and squeeze dry gently. 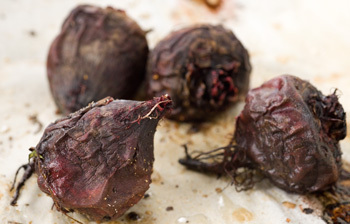 Roasting beets is not only easy, it brings out their incredible sweetness; boiling beets dilutes their distinctive taste. You can toss the peeled beets with walnuts and goat cheese and serve them atop arugula, but I prefer them plain, warm from the oven, with just a drizzle of extra-virgin olive oil and a sprinkling of sea salt and freshly ground black pepper. Preheat the oven to 375 degrees. Place the beets on a parchment paper-lined baking sheet and sprinkle with 1 tablespoon of the salt; roast in the preheated oven 1 hour, or until you can pierce them with a knife. Cool 5 minutes, then slip off the skins and slice thickly. My mother served this light, summery sauce often when I was growing up. It is wonderful with a thick, juicy steak, grilled pork chops, or firm-fleshed grilled fish like swordfish or tuna. The amount of cayenne pepper you add is altogether personal: add a lot for a searingly hot sauce or just a pinch for the merest hint of spice. Toss in a handful of croutons for textural contrast if you like. Place the eggs in a small pot. Cover with cool water and bring to a boil over medium-high heat. Remove from the heat and cover with a tight-fitting lid. Let rest, undisturbed, for 13 minutes. Drain off the water, rinse under cool running water, and drain again. Shake the pot with the hard-boiled eggs vigorously; this will crack the shells and create a small air pocket between the shells and the eggs, making peeling much easier. Rinse thoroughly and peel the eggs; rinse again to remove any bits of clinging shell. Cut the peeled hard-boiled eggs in half and set aside. 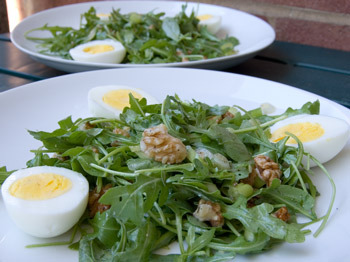 In a large bowl, toss the arugula, scallions, and walnuts with the lemon dressing. Taste and adjust the seasoning as needed. An easy and delicious side to meat and seafood. Add a handful of black olives to the roasting pan if you like; as the potatoes roast, the olives will release their lovely briny flavor and permeate the potatoes with their unmistakable aroma. Preheat the oven to 425 degrees (preferably set on convection bake). Lightly oil a wide roasting pan. Thickly slice the central part of the lemons (use the skinny end pieces to squeeze the juice later); arrange the lemon slices in the roasting pan (discard any pits from the lemon slices first). Scatter the halved potatoes over the sliced lemons, cut side down. Season with the salt and pepper. Squeeze the reserved lemon end pieces over the potatoes. Drizzle with the olive oil. Scatter the rosemary and garlic around and over the potatoes. Lime juice lends a vibrant flavor to this easy summer dish. Serve alongside rich grilled meats and fish for a refreshing contrast. In a small bowl, whisk together the lime juice, olive oil, salt, pepper, and cayenne pepper if using. 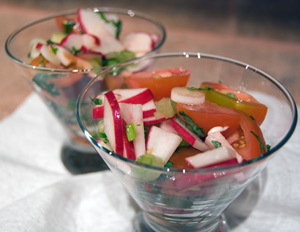 Toss the radishes, tomatoes, scallions, and basil with the lime dressing in a bowl. Taste and adjust the seasoning as needed. This colorful salad can be embellished with toasted pine nuts or slivered radicchio if you like. In a small bowl, whisk together the lemon juice, olive oil, salt, pepper, and oregano; set this dressing aside. Arrange the Romaine, hearts of palm, tomatoes, olives, bocconcini, and Prosciutto Cotto on 4 plates. This is a truly Mediterranean salad, with inspiration from Italy, Greece, and Turkey... A sprinkling of Aleppo pepper (a dried chili pepper from northern Syria and Turkey with a delicate spicy kick) gives this colorful salad a hauntingly delicious flavor. Look for Aleppo pepper and other spices at Penzey's. Bring 2 quarts of water to a boil. Add 1 tablespoon of the salt and drop in the asparagus. Boil until tender-crisp, about 3 minutes, then drain, cool under running water to stop the cooking and set the color, and blot dry. Arrange on a serving platter. 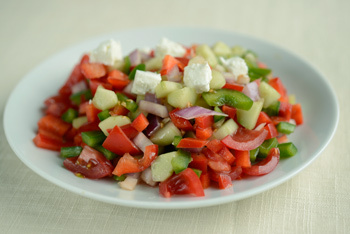 A refreshing yet boldly flavored salad that works equally well on its own or as a side to meat or fish; just be sure to buy vine-ripened grape or cherry tomatoes in the cold months. Roll 4 or 5 leaves of arugula at a time into tight bundles and thinly slice with a sharp knife (this is a chiffonnade). Toss the sliced arugula with all the remaining ingredients except the lemon wedges; taste, adjust the seasoning if needed, and arrange on a platter. Use a combination of chanterelles, morels, and oyster mushrooms in this robust calzone. If you can get your hands on fresh porcini mushrooms, they are divine in this dish. Mix the flour, yeast, and 1 tablespoon of the salt in a food processor. With the motor running, add enough warm (110°F) water (about 1 and 1/4 cups) to make a soft dough that rides the blade. Process for 45 seconds. Add a little water if the dough is dry or a little flour if it is sticky. Lightly oil a bowl, place the dough in it, shape into a ball and wrap. Let rise at room temperature until doubled, about 1 hour. Meanwhile, heat the olive oil in a 12-inch sauté pan over a medium-high flame. Add the garlic, parsley, and mushrooms, and sauté 15 minutes, or until the mushrooms have let out their water. Season with the remaining 1/2 teaspoon of the salt and the pepper; set aside to cool to room temperature. In a bowl, mix the mushrooms, Ricotta, and Parmigiano. Cut the dough into 4 pieces. Shape into 4 balls on a lightly floured counter. Cover and let rest for 15 minutes (this allows the gluten to relax, making stretching easier). Using a rolling pin (or your hands for a lighter texture), roll into 10-inch circles; the edges should be slightly thicker than the center. Top each circle with one-quarter of the mushroom mixture and fold in half to form a half-moon; seal the edges well with your fingers. Place on a baking sheet lined with parchment paper and brush the top with the egg. Place the baking sheet on top of the baking stone. 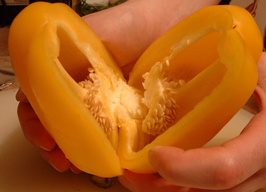 Select an assortment of sweet bell peppers for this delicious side dish: orange, red, and yellow look glorious combined. Avoid green peppers, which are not sweet enough to complement the basil dressing. Heat a grill pan over a medium-high flame until it is very hot. (The ridges in the pan are important, because they will give the peppers a grilled appearance.) Meanwhile, brush the peppers with a little olive oil. Place the red, yellow, and orange peppers on the grill pan and cook, stirring from time to time, for about 10 minutes, or until they are lightly charred and softened. Place the grilled peppers in a large serving platter while you make the marinade. In a medium bowl, whisk together the olive oil, vinegar, garlic, salt, pepper, and basil. Pour the basil marinade over the roasted peppers and allow to marinate for 15 minutes at room temperature or up to 2 days in the refrigerator. You can make your own bread crumbs by pulsing dried bread in a food processor until fine. 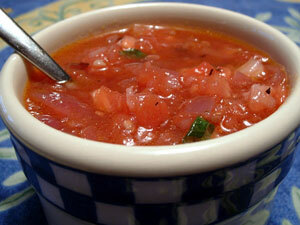 Combine all the ingredients except the tomatoes in a bowl; the mixture should form a soft, somewhat oily paste. Add more milk if it seems dry. 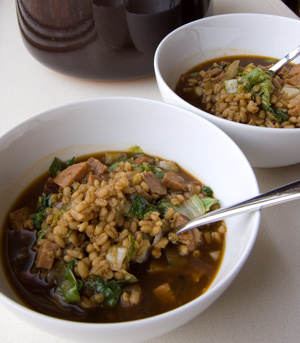 A favorite at our house, and a dish we crave no matter how often we eat it (and we eat it almost every day!). 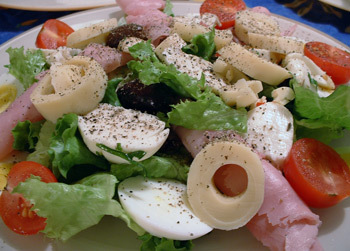 It is my mom's classic summer salad, delicious as is or embellished with some black olives for a more briny taste. Hearts of palm are delicious on their own or tossed with sweet carrots and purple onions for a more colorful, and crunchy, salad. You will find hearts of palm in cans or glass jars in specialty markets; be sure to drain and rinse them thoroughly before using them. When I was little, my grandmother Eva (who was born in Izmir, Turkey) cooked these braised string beans to accompany roasts, meatballs, and other main courses. Italian string beans are much thinner and more delicate than North American varieties; the closest substitute is haricots verts, thin French string beans available in most specialty greenmarkets. Although the cooking time for the beans may seem inordinately long (45 minutes over low heat), the flavor and texture are just incredible: the beans cook up buttery soft, with a deep, earthy flavor and a rich sauce that is sheer heaven on a slice of crunchy bread. Both Turkish cooks (like my grandmother) and Italian cooks love their string beans cooked low and slow... and I do too. Heat the olive oil in a heavy-bottomed 2-quart pot over a medium flame. Add the onion and garlic, and cook 5 minutes, stirring often. Fold in the beans and tomatoes, season with the salt and pepper, and pour in 1 cup of water. Bring to a gentle boil; cover and reduce the heat to medium-low. 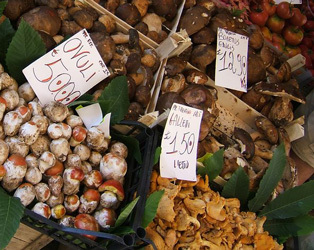 Funghi trifolati (mushrooms sautéed with garlic, parsley, and olive oil) are an all-time favorite across Italy. 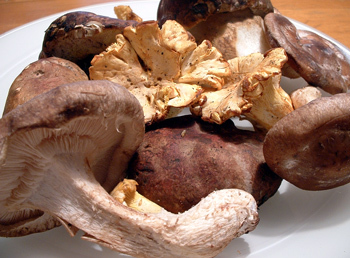 Select a variety of mushrooms for the most intense flavor. Try serving the mushrooms as a pasta sauce, not just as a side dish to meat and poultry; or spoon atop crostini with shaved Parmigiano as a delectable finger food. Heat the olive oil in a 12-inch sauté pan over a medium-high flame. Add the mushrooms and sauté until all the liquid has evaporated and they are lightly browned in spots, about 10 minutes. 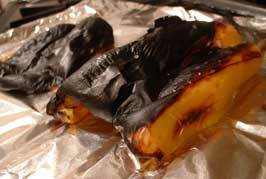 Be careful not to burn the mushrooms at this point or the dish will be acrid rather than gentle in flavor. The creamy tuna mousse can be spread onto toasted bread for an even easier palate teaser. You can turn it into a succulent first course by tossing it with 1 pound of boiled pasta, or a delicious main course by spooning it over poached sliced chicken or turkey breast. 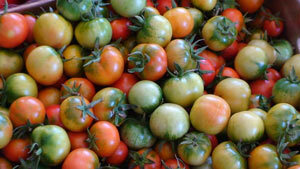 Rinse the cherry tomatoes and cut off their tops; scoop out the seeds with your finger or a tiny spoon. 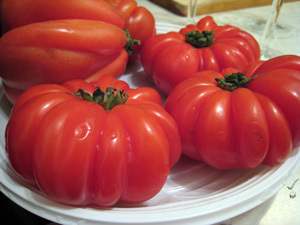 Trim the bottoms of the cherry tomatoes in order to stabilize them. Place the cherry tomatoes upside-down on a rack set over a tray to drain for 15 minutes. 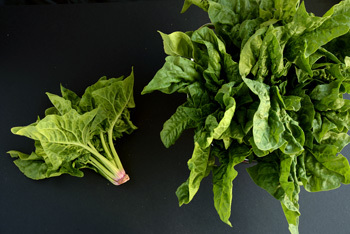 Swiss chard leaves work well instead of spinach, but require blanching before they are sautéed and take a few minutes longer to cook through. Soak the raisins in warm water to cover for 30 minutes; drain and blot dry. Heat the olive oil in a 14-inch sauté pan or wok. Add the garlic, onion, and pine nuts, and cook until the nuts are golden, about 5 minutes, stirring often; watch that the garlic and pine nuts do not burn, or the dish will taste bitter. Stir in the drained raisins and cook 1 more minute, still stirring. Stir in the spinach and cook until wilted, about 5 minutes, stirring often or tossing with metal tongs. The generous use of herbs in these mini frittatas makes a nice counterpoint to the sweetness of the onions. Instead of individual frittatas, you can prepare an 8-inch frittata instead: a lot less work, and equally delicious. Heat 1 teaspoon of the olive oil in a 12-inch nonstick skillet over a medium-high flame. Add the onion and cook 15 minutes, or until soft and lightly browned all over, stirring often. Season with salt and pepper, fold in the parsley, thyme, marjoram, mint, and basil, and cook 2 more minutes; remove from the heat and cool to room temperature. Beat the eggs, milk, flour, and Pecorino in a large bowl. Fold in the onion mixture and adjust the salt if needed. Heat the same 12-inch nonstick skillet over a medium-high flame. Pour in 1 tablespoon of the olive oil and swirl to coat the skillet with the oil. Drop in 6 spoonfuls of the egg mixture about 2 inches apart and cook until golden and set on the bottom, about 4 minutes; turn and cook until the other side is also golden and set, about 2 minutes. Remove the frittatas to a platter. 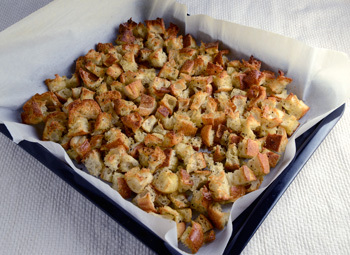 Toasting focaccia cubes makes for truly delectable croutons. Spread the cubed focaccia out on an 11-inch x 17-inch baking sheet and toast in the preheated oven until golden and lightly crisp, about 5 to 8 minutes. Meanwhile, macerate the scallions with the lemon juice, olive oil, salt, and pepper for 30 minutes. Look for mustard seeds in specialty markets; Indian shops always stock them. Their subtle mustard flavor is a splendid complement to the fresh tarragon in this crisp salad. In a pinch, you can substitute Dijon mustard (use about 1 teaspoon), but you'll miss out on the seeds' lovely crunchy texture. Toss all the ingredients in a large bowl; set aside 30 minutes. Serve this refreshing vegetable dish with grilled fish for a memorable main course. To slice the zucchini into paper-thin ribbons, use a mandoline or a vegetable peeler (a vegetable peeler will yield narrower strips, and is less dangerous than a mandoline). 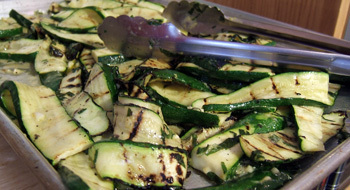 Place the zucchini slices in a wide, shallow dish and add the lemon juice and salt; set aside 30 minutes. Meanwhile, heat 1 teaspoon of the olive oil in a 12-inch skillet over a medium flame. Add the almonds and paprika; cook, stirring often, 5 minutes, or until golden. Immediately remove to a bowl to stop the cooking (the almonds may burn otherwise). 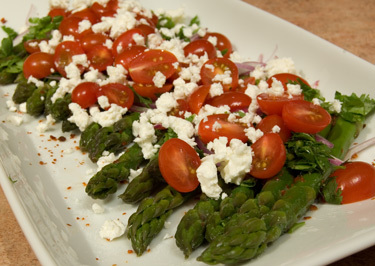 Try string beans instead of asparagus for another great vegetable dish. 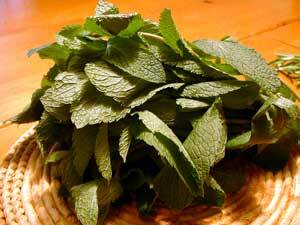 You can omit the ginger and add a few rosemary sprigs and sage leaves instead. Place all the ingredients in a 12-inch skillet. Cook uncovered over medium-high heat 5 to 8 minutes, stirring once in a while, or until the asparagus are golden brown in spots and starting to soften. Canned beans are one of the few canned foods I really like, and I often use them instead of dried beans in soups, stews, and even salads to save on soaking and cooking time. 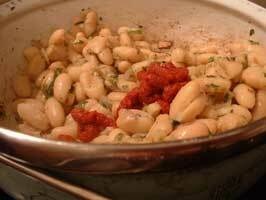 In this easy recipe, I braise cannellini beans with onions, garlic, and a hint of tomato, and throw in Swiss chard for an earthy flavor and silky texture. 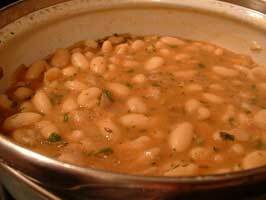 I serve the beans piping hot as a side dish to meat, poultry, or savory pies, or as an antipasto spooned atop toasted bread rounds. Heat the olive oil in a 1-quart pot over a medium-high flame. Add the garlic and cook 30 seconds, stirring constantly; the garlic should become aromatic and just lightly golden (do not burn it or it will taste acrid). Stir in the chili pepper and cook 15 more seconds. Add the onion and cook, still stirring, about 2 minutes, or until the onion becomes translucent and soft. Stir in the pepper and parsley and cook 1 more minute. Fold in the rinsed and drained beans, and then stir in the tomato paste. Add enough cool water (or chicken broth if you happen to have it on hand) to cover the beans by 1/4 inch (about 1 and 1/2 cups, depending on the width of your pot). It is very important to rinse canned beans thoroughly before using, or they will taste canned. To rinse beans, open the can into a colander. Drain the canning liquid. Rinse the beans under cool running water for 2 minutes. Drain the beans thoroughly again. The beans are now ready to use in soups, stews, salads, and more. Note that the same rule applies to any canned vegetable or legume. Heat 1 tablespoon of olive oil in a 1-quart pot over a medium-high flame. Add 2 chopped garlic cloves and cook 30 seconds, stirring constantly; the garlic should become aromatic and just lightly golden (do not burn it or it will taste acrid). Stir in 1 dried red chili pepper or 1/4 teaspoon chili flakes and cook 15 more seconds. Add 1 minced purple onion and cook, still stirring, about 2 minutes, or until the onion becomes translucent and soft. Don't cook the onion long enough to caramelize or brown it, or it will become too sweet. Stir in 1/2 teaspoon freshly ground black pepper and 1 tablespoon minced Italian parsley and cook 1 more minute. The aim here is to liberate the aroma from the pepper and parsley by infusing them in the hot olive oil, not to cook the onion until it caramelizes. 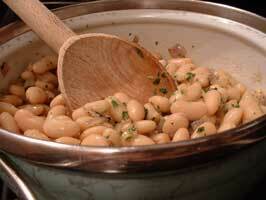 Stir the drained and rinsed beans (from one 15-ounce can cannellini beans) into the aromatic base in the pot. Stir in 1 tablespoon of tomato paste (I suggest a good Italian brand for best flavor). Add enough cool water (or chicken broth if you happen to have it on hand) to cover the beans by 1/4 inch. You will need about 1 and 1/2 cups of water, depending on the width of your pot. Season the beans with 1/2 teaspoon of salt and bring to a gentle boil, uncovered, stirring once in a while. Cover and lower the heat to medium-low; cook for 5 minutes. 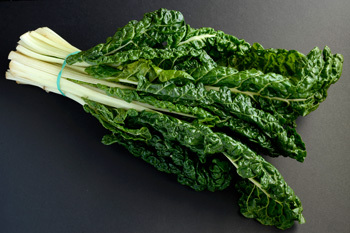 Uncover, stir in 1 bunch of washed, stemmed, and chopped Swiss chard leaves, and cover again. Strips of succulent roasted peppers tossed with nothing more than olive oil, slivered garlic, sea salt, and a few torn leaves of fragrant basil: this is summer on a plate. Accompanied by a hunk of crusty bread, a piece of pungent Pecorino, a handful of olives, and a chilled bottle of white, you have a satisfying alfresco meal. Now that the gardens and farmers' markets are bursting with sweet peppers, it's time to roll up our sleeves and make the most of the season's bounty. But if roasting peppers seems like a messy, tedious, and difficult job, nothing could be further from the truth. I've developed an easy, quick and mess-free technique for roasting and peeling peppers--it takes mere minutes of work and the results are far better than anything you can buy in a store. Scoop out the seeds, stems, and membranes from each pepper half. Arrange the pepper halves cut side down on an aluminum foil-lined baking sheet. Broil for 20 minutes, or until the skins are blistered and charred and blackened all over. Remove the peppers from the oven, wrap them snugly in the aluminum foil you used to line the baking sheet, and set aside for 15 to 30 minutes, or until the peppers cool to room temperature; the steam created by the hot peppers in the tight aluminum foil bundle will help to lift the skin from the flesh of the peppers, making peeling easier later. 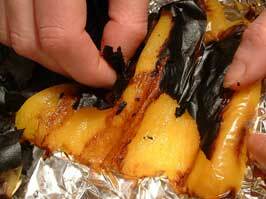 Unwrap the aluminum foil, then slip the skin off the peppers using your fingers. It should come off easily, thanks to the steam trapped by the sealed aluminum foil. You can leave the roasted peppers in perfect halves; you can cut them into strips or dice; or you can puree them in a food processor until velvety for use in sauces, dips, and spreads. To store the roasted peppers in the refrigerator: Pack them into glass jars, cover with extra-virgin olive oil, and tuck 1 or 2 peeled garlic cloves and a handful of washed basil leaves in each jar; refrigerate for up to 1 week. To freeze the roasted peppers: Place the peppers in plastic freezer-safe bags and freeze immediately (roasted peppers will keep in the freezer for up to 1 month). 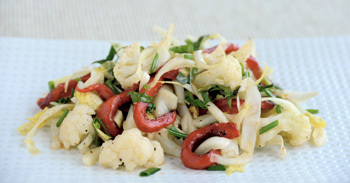 Serving ideas: Use the roasted peppers in salads, pasta sauces, or as a garnish atop crostini or bruschetta. They are also wonderful in rice dishes or pureed into sauces for meat, fish, or poultry. Quick tip: Make large batches of roasted peppers, as they shrink tremendously upon roasting (just think about what happens to spinach). Recipe: check out this fantastic crostini recipe featuring roasted peppers. Whether you eat it raw or cooked, garlic can be hard to digest. Here's a little trick to make garlic more digestible. 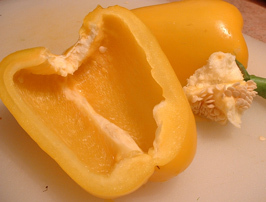 Before you crush, chop, or mince it, remove any bruised or browned spots, including the little flat end, which often turns dark and hard; slit the clove in half vertically and discard the inner germ, which changes from white to green to brown as the garlic ages (the darker the germ, the more important it is to discard it). Because of their high fat content, nuts are especially susceptible to rancidity. To keep nuts fresh for longer, store them in the refrigerator (up to 2 months) or in the freezer (up to 6 months), then return to room temperature before eating or incorporating them in your recipe. The cold will not affect the nuts' flavor or texture, but it will slow down the nuts' deterioration. When buying eggplants, choose unblemished ones without soft spots or bruises; bruises often mean the flesh will be unpleasantly bitter. Another factor that affects eggplants' bitterness is ripeness: ripe eggplants are sweeter and less bitter than under-ripe ones; they will be firm to the touch, but not hard, and should yield a little when pressed with your finger. The stem should be green in color, with no trace of mold or softening, and firmly attached to the eggplant. If possible, select smaller eggplants--the smaller they are, the more intense their flavor and less watery their flesh. And if you can, opt for female eggplants, which are less bitter than male: they have an indented little belly button at the bottom end, so they're easy to spot. Just what does it mean when a recipe instructs you to "snip" chives? 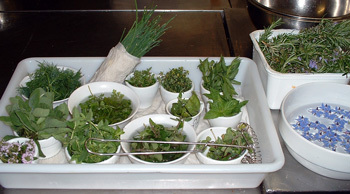 Even if it sounds like it may just be a fancy way of saying "mincing," snipping is actually a different technique, and is applied most often to chives (and not other herbs). To snip, you need scissors (unlike mincing, which requires a knife). Chives are ideal tackled with a pair of scissors: not only do you avoid crushing them with the heavy weight of a knife, you can cut through many chives at a time effortlessly, thanks to the chives' perfectly linear shape. Snipped chives look perkier and more even than minced chives--and they oxidize far less quickly than minced chives. To snip chives, hold up the amount you wish to cut over a cutting board or plate, and snip into the desired length with a sharp pair of kitchen scissors. Just be sure (as with all herbs) to blot chives dry thoroughly after rinsing, or they will stick together and stick to the blade of the scissors. Blanching vegetables just means cooking vegetables (green, starchy, or otherwise) in boiling water until partially cooked--a blanched vegetable is typically roasted, fried, sauteed, or baked after blanching and draining. Blanching prepares the vegetable for further cooking; it tenderizes the vegetable so that the final cooking (in the oven, on the stove, in hot oil) takes less long. Add the vegetables and season with salt. Cook until crisp-tender when pierced with a knife. Drain and proceed with whatever recipe you are following. You may want to shock (see boiling vegetables , steps 2 and 3) your blanched vegetables in ice water immediately after draining to stop the cooking and set the color. Drain and proceed with whatever recipe you are following. The procedure is somewhat different for starchy vegetables like potatoes, yams, turnips, etc... You need to start them in cool water because starchy vegetables take longer to cook through than green vegetables like string beans or other vegetables like cauliflower. If you start starchy vegetables in boiling water, the risk is that the outside of the vegetable cooks through and becomes mushy before the inside has a chance to cook. Place the vegetables in a large pot with ample cold water to cover and season with salt. Proceed as above (steps 3, 4, and 5). 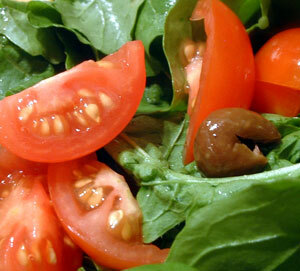 Italians tend to prefer vegetables soft; in North America, the penchant is for crunchy (or crisp-tender) vegetables. Keep in mind that the longer you cook vegetables, the softer they get. 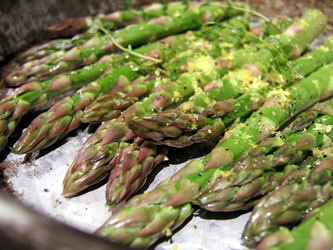 Green vegetables (asparagus, broccoli, string beans, etc...) lose their bright green color when cooked a long time. If you intend to serve your boiled green vegetables cold, place them in a bowl of extremely cold water (or water with a few ice cubes in it) immediately after draining; this procedure, called shocking, sets the color and stops the cooking. All vegetables, from potatoes to carrots to asparagus, can be shocked after boiling (see above); keep in mind that shocking robs vegetables of some of their starch, so you may not want to shock potatoes or other starchy vegetables if starchiness is key to the texture or taste of the final dish. To minimize discoloration of green vegetables, cook them in an uncovered pot. Stirring vegetables once in a while as they cook ensures even cooking. Also to ensure even cooking, use a very large pot filled with ample water. No need for fancy reamers and citrus presses: all you need to get the most juice out of your lemons, limes, oranges, and grapefruit is to roll the fruit back and forth along the counter as you apply pressure, then cut the fruit in half and squeeze each half forcefully with one hand as you place your other hand beneath to catch any seeds or membranes. Some cooks prick citrus fruit with a fork after rolling it along the counter, before squeezing--try it and see if you like it. If you're tired of throwing out lettuce, wash a head of lettuce and store whatever you don't eat right away in the refrigerator for up to a few days. Dry the lettuce thoroughly, keep the leaves whole, then place in a large bowl and cover with a double thickness of paper towels that have been moistened with water and wrung almost dry. The lettuce will remain crisp and fresh this way for up 2 or 3 days in the refrigerator--no need to overdose on lettuce just after washing it for fear of limp leaves, and no more wasted lettuce. To avoid water-logging strawberries, always rinse them before cutting them. If you cut your strawberries before rinsing them, the water will penetrate the strawberries much more--making for watery berries (all that exposed flesh is a great entry for moisture). Dry your berries gently on a paper towel and then cut just before serving. And to avoid mushy, soft strawberries, try to rinse berries immediately before eating or using them--no more than 1 hour ahead if possible.